Microwave dyeing is a quick and easy way to dye small quantities of protein fiber using acid dyes. 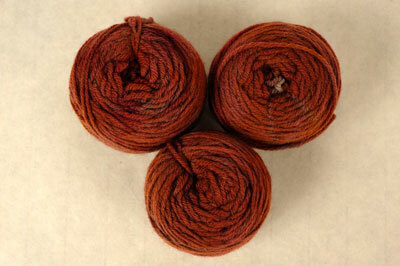 It is a great method for dyeing fiber for a small project or for quickly sampling colorways. 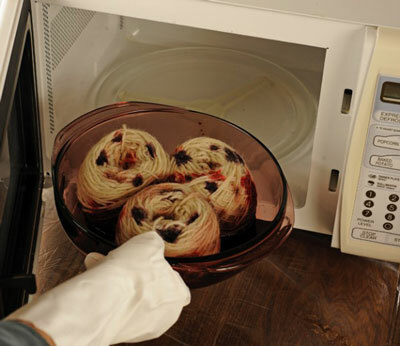 Use the microwave method to touch up white spots on hand-painted yarns. Once a microwave oven is used in dyeing, it should never be used for food preparation, so look for an inexpensive or used model for craft projects. Microwave dyeing transfers dye and acid vapors into the room during the steaming process. Always use ventilation and a vapor mask to avoid inhalation of the fumes. Follow all guidelines for safe dyeing as described in “Safety Essentials” in Chapter 2. Never use dyeing tools or equipment for food preparation. Fiber that has been cooked in a microwave oven becomes extremely hot. Wear oven mitts when handling the dishes. If you need to handle hot fiber, use tongs or a spoon. Presoak the balls of yarn in an acid solution for at least 1 hour to ensure that the solution completely saturates the yarn balls. Use a 5-gallon plastic bucket with a lid. Add 6 tablespoons citric acid crystals and 2 teaspoons Synthrapol to 1 gallon room-temperature water (approximately 95°F/35°C). Remove the yarn balls from the acid soak and gently squeeze to remove excess water. The yarn should be damp but not dripping wet. 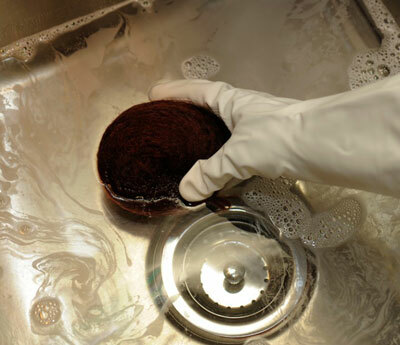 Use a small towel to blot excess water before dyeing. Pour 100ml of the Reddish Brown dye stock into the casserole dish and arrange the balls in the dish. Using a plastic syringe, draw approximately 10ml of the Reddish Brown dye solution and inject it into the center of each ball. This will help evenly distribute the main color. Use a plastic syringe to inject pockets of the accent colors at evenly spaced intervals. Starting with Chinese Red, draw approximately 12ml of dye stock into the syringe. Inject in even increments into the side of each yarn ball. 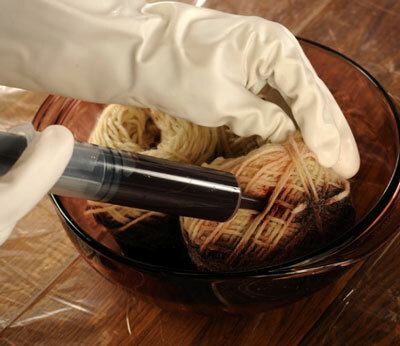 Draw the same amount of the Plum dye stock into the syringe and inject pockets of color in equal amounts in four places near the top of the ball. Use the tip of the syringe to penetrate the yarn ball so that the color reaches the yarn in the center. Place the cover partially over the casserole dish and place it in the microwave. Set the timer for 2 minutes. Allow the yarn to sit for 2 minutes, then turn the balls upside down and inject about 12ml of Plum dye stock in four places at the top of each yarn ball. Then cover the dish and place it in the microwave for another 2 minutes to set the dye. Use hot mitts when handling the hot dish; do not attempt to handle the yarn when hot. Allow the balls of yarn to cool completely before rinsing in the sink with warm water and Synthrapol. This step is a good indication of whether the dye has bonded with the fiber. Excessive bleeding in the water means you need to dip the yarn in white vinegar or a mild acid solution and then steam in the microwave for another 2 minutes to set the dye. Use a towel to press the excess water out of the yarn and place the yarn balls on a flat surface with good air circulation to dry. When the yarn is partially dry, rewind each ball into a skein. This is the exciting moment when you see the pattern created by the pockets of injected dye. Give the skein another warm rinse to remove any residual dye. 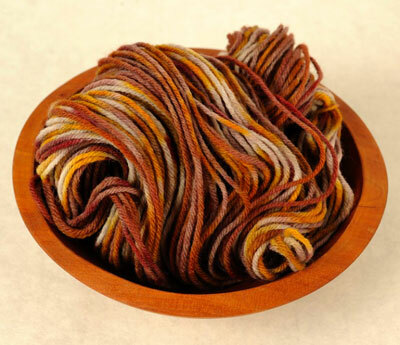 If you notice excess dye bleeding at this stage, dip the skeins in vinegar and place them in the microwave for another 2 minutes.